Real estate conveyances in Massachusetts are governed under Massachusetts General Laws Chapters 183 and 184. Quitclaim deeds transfer the rights, title, and interest in real estate, if any, from the grantor (seller) to the grantee (buyer). This deed transfers property without any warranty and with no covenants of title, and is separate from the statutory quitclaim deed with limited covenants under (G.L.c. 183 sec. 17). 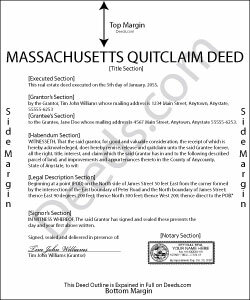 While not statutory, this type of quitclaim deed is still valid for transferring title to real property in the State of Massachusetts. It is especially useful for transactions between family members, clearing title, and in cases of divorce. In addition to meeting all state and local standards for recorded documents, a lawful deed identifies the name, address, and marital status of each grantor and grantee (G.L.c. 183 sec. 6). State law requires that all land records contain information on how the grantee will hold title (G.L.c. 184 sec. 7). For Massachusetts residential property, the primary methods for holding title are tenancy in common, joint tenancy, and tenancy by the entirety. A grant of ownership of real estate to two or more persons, regardless of marital status, is presumed to create a tenancy in common, unless the deed expressly states otherwise (G.L.c. 184 sec. 7). As with any conveyance of real estate, a quitclaim deed requires a complete legal description of the parcel. The deed must state the amount of the full consideration, or the total price paid by the grantee for the transfer (G.L.c. 183 sec. 6). Based on the consideration paid, the seller pays an excise tax (also known as a transfer tax or stamp tax) to the Registry of Deeds office (G.L.c. 64D sec. 1, 2). Record the completed deed at the local County Registry of Deeds office. Some counties (Berkshire, Bristol, Essex, Middlesex, Worcester) are split into two or more recording districts. Make sure to record the deed in the correct recording district. If the deed pertains to registered land, submit the deed to the Registry District of the Land Court. Include all relevant affidavits, forms, and fees along with the deed for recording. For guidance related to supplemental documentation, speak with the local Registry of Deeds office. This article is provided for informational purposes only and is not a substitute for legal advice. Contact a lawyer with questions about quitclaim deeds or transfers of real property in Massachusetts. Shannon F. said: Quality, professional forms. Good value. Reply from Staff: Thank you for the kinds words Katie. have a fantastic day!